Get away from it all, in a quiet neighborhood, a short distance out of town, this spacious home awaits you. It's dog friendly, has WiFi and mountain views! Escape to this beautiful and roomy log home and enjoy the Beartooth Mountain Views! It is secluded yet easily accessible to Red Lodge. With 4 private sleeping areas and bed space for 10 people this cabin easily welcomes the friends and extended family. Decks on three sides give additional summer recreational space with a gas grill. The fully finished basement offers a home theater including a 60 flat screen TV! Come enjoy this unique Red Lodge oasis. The spiral staircases add unique character. Anyone with mobility issues would want to take one of the bedrooms on the main floor. Please also note that the railing on the spiral staircase has supports that are a bit wide and are not toddler friendly. There is a bedroom on the upper level with a queen sized bed and a full bath. There is a loft area located just outside the upper bedroom with a twin-sized futon. The main level has two bedrooms with a queen bed in each and a shared bath. The lower level has a sleeping area with a queen bed, a full bath (jetted tub) and in the family room on this lower level there is a queen sized futon. In our dog friendly homes, we require dogs to be left in a crate when left home alone, if you are flying or do not have room in the car we can deliver a crate to the home for your dog to use for a fee of $25 for the entire stay. You can rent a Pack n Play for your little traveler to use for fee of $25.00 for the entire stay. Why go out to eat - when you can enjoy great food at the comfort of your beautiful vacation rental? Award winning Chef Michael Muirhead of Más Taco delivers his signature dishes right to your home. A $25.00 dollar non-refundable service fee will start your meal delivery and the rest will be coordinated with Más Taco staff via emails. Total cost will be based on menu and group size. Take advantage of this homes wood fireplace or fire pit with a S'mores basket filled with a bag of marshmallows, a box of gram crackers, 6 chocolate bars, and 6 peanut butter cups and marshmallow sticks. For a fee of $20.00 we will deliver to the home prior to arrival. Earlier I emailed and explained our group and received a great reply with the properties they recommended that would work for our group! Nailed it. We had a wonderful time ! Very quiet and peaceful, but we like being in town ( we are spoiled ). I need to change our reservation for this July to a different place, hopefully in town or closer to town with at least 2 bathrooms . If you have any suggestions please let me know before I cancel Sallys Cabin. Very enjoyable. Great location with wonderful patio views. My experience was only positive. Those with whom I spoke seem to understand the I was completely inexperienced with the rental property and had appropriate responses to my questions. "Beautiful cabin and views Our family loved this cabin! Lots of space, very clean, minutes from town. The staff was very helpful. We lost power due to a wind storm and the company was professional and kept in contact with where the power company was in fixing the problem. We are already planning our next visit! " "Amazing rental, loved it! We rented this cabin for early Christmas with my husband's family. We stayed three nights, and wish it could have lasted longer! Cabin was perfect for us! Great ambience! location was beautiful, about five miles outside of Red Lodge. I enjoyed walks in the mornings and taking in the mountain views. We were very comfortable at cabin, sitting around, playing games and enjoying family! Plenty of room to spread out. Piney, the rental manager was wonderful to work with. hope to rent this cabin again in the future with friends! We had deer come right up to cabin and eat out of the bushes, and two moose were rambling around one night as well! " "Great cozy cabin with tons of space! Sally's Cabin was the perfect location for our two families to meet for some R&R and fun. The setup of the home is ideal for families of any size- the lower level was perfect for our teenagers, the main level ideal for everyone to gather for games and food and PLENTY of beds and seating for everyone to be comfortable. We were so pleased it was very clean, updated and welcoming. Well stocked kitchen with everything needed to prepare meals, bathroom towels etc. That was awesome! We thoroughly enjoyed our days there and will DEFINITELY be coming back for another family getaway. Thank you for sharing this amazing home with us ! " "Just what we needed. We needed time as a family to just hang out and be together. That is exactly what we received. The best part for us was that the cabin has 3 different levels, giving us our own space when we felt we needed that. The peace and quiet was wonderful and watching the deer go through the yard was awesome too. Fully equipped, we just walked in and started enjoying our weekend. My only suggestion is there were light bulbs burnt out that needed to be replaced. not a big deal but would have made games easier to play at the game table...will definitely rent this property again, which will be our third time there. " "Sally's Cabin Left on Aug 8, 2016 for a stay in Jun 2016 We were at Sally's Cabin for an 80th birthday party weekend for my mother. The accommodations were more than comfortable and we had a very enjoyable time there. Everything worked in good order and the cabin was well supplied with all the necessities we needed. I would definitely recommend this cabin to others! " "Perfect Stay! We brought a group out to do some skiing in June. The property was perfect. Lots of room to play outdoor activities! The set up with the house was great. It is also nice having 3 bathrooms and very comfortable beds. I would recommend this to everyone. 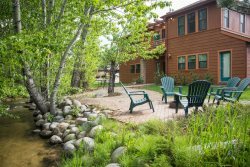 We annually come to Red lodge and I am planning on booking again! "Wonderful home/Great time The only thing wrong with our stay is that it was too short!!! We were in town for a family wedding so time at the house was minimal. Our whole family would love to return and stay here at least a week next time!!! This house is extremely comfortable and has such a cozy atmosphere!! Everything we needed was available at the house! If you have small toddlers (as we did) you may want to bring a roll of mesh to put around the staircase. It is beautiful but not toddler friendly. Very small issue! We just placed the game table chairs around staircase for extra protection and it was fine. The house was actually a little bigger than the description which was great! My daughter, her husband and the kids stayed downstairs and it was perfect! They had full bathroom with a huge tub and a nice big TV, recreation room and bedroom. The washer and dryer being downstairs was a bonus!! Aaa Red Lodge Rentals was great to work with!! They accommodated us in every way possible!! Can't wait to return!!! Thanks again!!! " "A taste of the good life Three members of our family planned a six day bears hunt in the mountains around Red Lodge, the rest of us decieded to make it a family reunion. We rented Sally's Cabin because it was pet friendly and I have a dog that thinks she is human. We were overwhelmed at the beauty and comfort of the cabin. Even though it rained four of the six days, we had a wonderful time. We cooked and ate more than we should have, played games, sat before the fire place and talked, laughed and made good memories. The agency came through with all they promised, I would recommend them highly. And oh darn, the guys didn't get a bear so we have to do this again in September. Thank you God for unanswered prayer "
"Great Idea! We really like this place. It was our 2nd time there. Layout is great for up to at least 8 people, great kitchen, good accoutrements (stereo, tv, two gas fireplaces,big grill), and beautiful private setting close to town. " "A weekend basketball tournament Again.. we enjoyed our stay at Sally's Cabin. Our kids were here for the youth basketball tournament this time. We invited the kids and their parents out for lunch and were able to visit and get to know each other better. Sally's Cabin is perfect for larger family gatherings and is located in a quiet area outside of town. As always, AaA made it a very simple process to get checked in and the house was ready for us when we got there. Thanks to Piney and her crew and also a big thanks to Sally for sharing her home with us again. We plan on renting sally's cabin again in the future!! " "A great family experience! We really enjoyed our time at Sally's Cabin. Two days of skiing, good food, and plenty of room to play games. Really enjoyed the cabin feel and the wonderful space inside and out. Everyone had good sleep at night as the beds were very comfortable. The cabin has lots of room to move around. Only wish there was a hot tub outside...great views. "